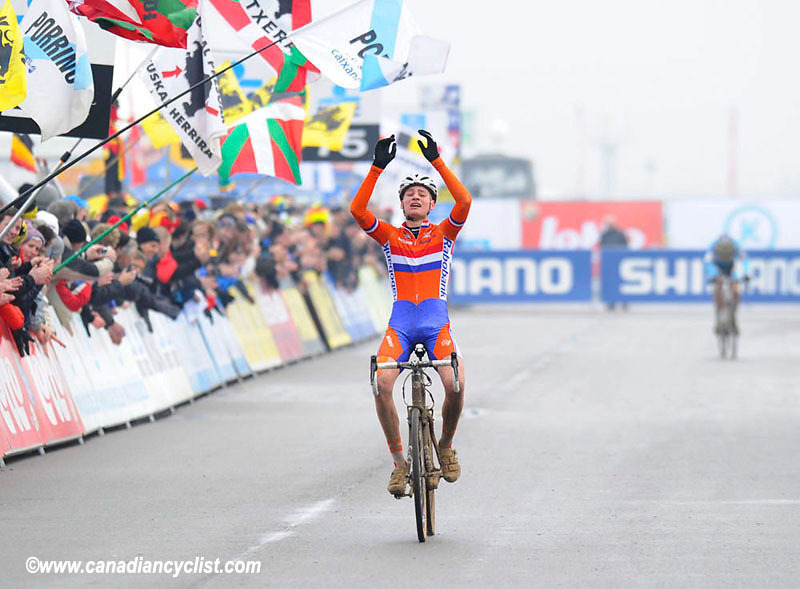 It was a Dutch day in Koksijde, Belgium for the first day of the Cyclo-cross World Championships on Saturday, as the orange machine won both world titles on offer in the Junior and Under 23 men's categories. Host Belgium could 'only' manage a pair of silvers, with the Netherlands scooping up another bronze medal in the Under 23 race, while the French took the remaining bronze from the Junior competition. The day started out sunny and warm, at almost 10 Celcius when the Junior men started, but gradually it clouded over and became damp and cold, although the rain fortunately held off. The weather had no impact on the crowds, which were huge - 20 deep on the sides of the sand dunes which make Koksijde such a unique venue. In the Junior race, the favourite, Mathieu van der Poel, son of the Classics star Adrie, took an emotional win. He led out early in the 40 minute race, then faltered in the second and third lap, dropping back as far as fifth before he began to move up again. For a while, the Belgian fans could hope for victory, with riders sitting 1-2-3, but van der Poel gradually reeled them in and, with a lap and a half to go, dropped Wout van Aerts to regain the lead and ride to victory. Quentin Jauregui took the bronze for France when he dropped Belgians Quinten Hermans and Daan Soete in the last lap. Yohan Patry and Sam Beaudoin were the two Canadians in the race, and both got caught up in the foot traffic through the sand early in the race. Patry finished in 40th, on the same lap as the leaders, while Beaudoin was 50th, two laps down. Patry was not particularly happy with his ride, since he had been looking for a top-twenty after some strong results in earlier European races. Watch our video interviews with Patry and Beaudoin Here. The Under 23 race unfolded in a similar fashion, with favoured Lars van der Haar of the Netherlands jumping into the lead and then faltering, allowing Wietse Bosmans of Belgium to catch and drop him. Once again, Belgian hopes were raised and then dashed, as van der Haar and his team mate Michiel van der Heijden bridged up to the Belgian. 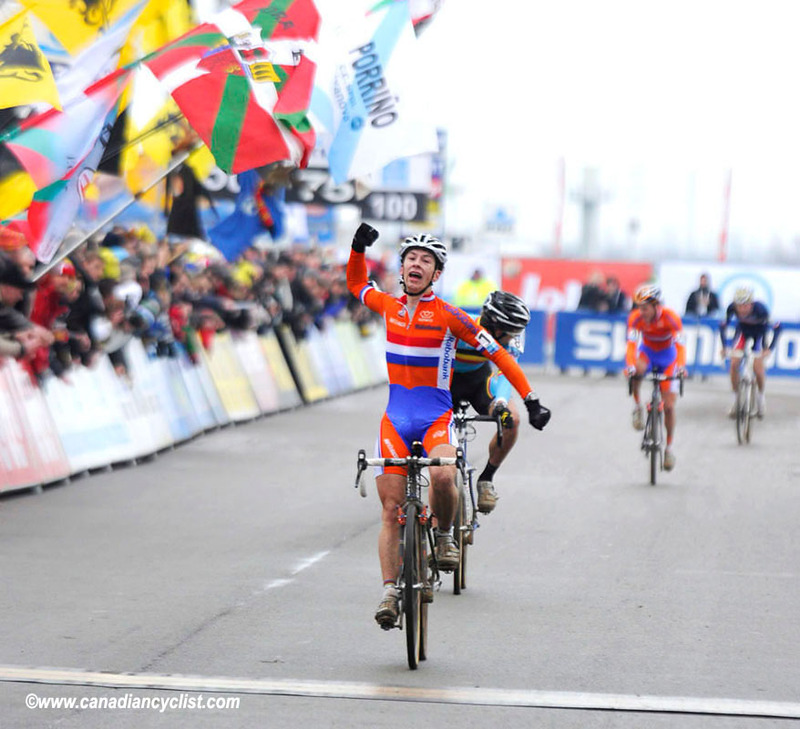 Bosmans made a last lap attack through a sand section, riding when the others were running to gain a few metres, but van der Haar came back and then dropped his rival in the final kilometre to take the title. Canada's lone entry was Felix Coté Bouvette, finishing in 46th place, three laps down. Despite being lapped, Bouvette was happy overall with his result, gaining valuable experience at his first Worlds. Watch our video interview with Felix Coté Bouvette Here.